Festival-goers danced to the music of Gerard Delafose. The audience at the 38th annual Natchitoches-NSU Folk Festival held on July 14-15 was entertained and educated about the rich and diverse cultural offerings of the state. The Festival featured traditional Louisiana foods, Kidfest activities, music, traditional crafts, narrative sessions, musical informances and cultural exhibits. This year’s festival theme “Keeping Tradition Alive!” was a great success, with a very happy audience. The festival opened with a rousing dance, beginning with Cajun dance lessons, followed by classic country by Gal Holiday and the Honky Tonk Revue, zydeco music by Gerard Delafose and the Zydeco Gators, and Texas swing by the Caddo Creek Band. 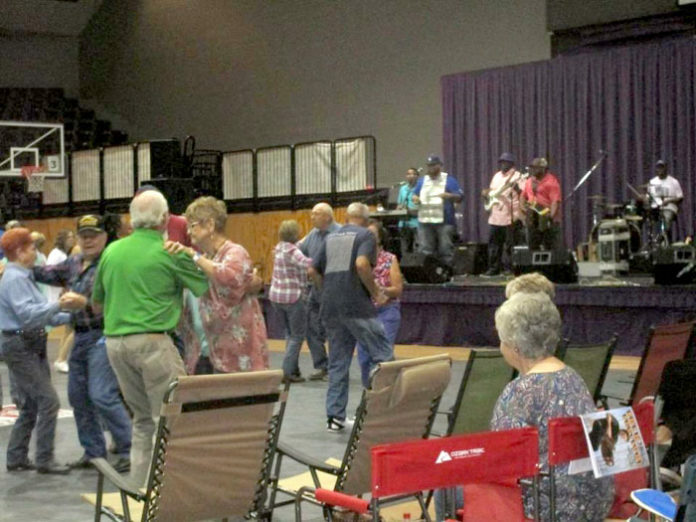 Side stage performances included Natchitoches gospel group Joyful Sounds, Ed Huey and Natchitoches favorite Hardrick Rivers and the Rivers Revue Band, as well as an open bluegrass and country music jam led by Marcy Frantom and Max Turner. Saturday’s events included performances in Prather Coliseum by the Back Porch Band, Nathan and Eva, bluegrass by the Clancey Ferguson Band, Zydeco by Terrance Simien and the Zydeco Experience, Creole la la with Goldman Thibodeaux and the Lawtell Playboys, country by Gal Holiday and the Honky Tonk Revue, cigar box guitar music demonstrations by Mike Snowden, blues music by Cane Mutiny, Hezekiah Early and the Houserockers, the Wayne “Blue” Burns Band and the Snake Doctors, American roots music by the Hoodoo Papas and the Hoochie Digs, Cajun music by Ray Abshire and Friends and Steve Riley and the Mamou Playboys, Texas swing by the Caddo Creek Band, special appearances by Mariachi Jalisco US and the Winnsboro Easter Rock Ensemble, a jam session with Max and Marcy, as well as Cajun dance lessons. In addition to stage performances there were narrative sessions and music informances, including conversations about Delta bluegrass, preserving French culture, Choctaw wedding traditions, Choctaw-Apache foodways, country music history in the Delta, blues music in the Delta, preserving Delta material culture, St. Joseph’s altars and Zydeco traditions. Outdoor activities included cattle dog demonstrations, the Red River Smiths and a maypole for children. This year the Festival continued a series of free workshops for festival attendees. Festival goers attended a highly popular Cajun accordion workshop led by musicians Ray Abshire and Steve Riley. The annual Louisiana State Fiddle Championship was also held on Saturday in the Magale Recital Hall as part of the Festival. Fiddle Championship judges included fiddlers Joanna Calhoun, Steve Harper, Andrej Kurti and Leo “Buddy” Terzia. The new Louisiana Grand Champion is Joe R. Suchanek of Fields, with second place going to Mary Elizabeth Harris of Breaux Bridge, followed by Ronald Pace of Alexandria in third. Harris won the 21 and under championship division and Suchanek took first in the 60 and up championship division, with Pace coming in second. As the new Louisiana State Fiddle champion, Suchanek also performed on the main stage in Prather Coliseum. A noted Louisiana crafts person, two drummers, a blues musician and an eminent Cajun music artist were inducted into the Louisiana Folklife Center’s Hall of Master Folk Artists: Traditional doll maker Barbara Franklin, blues performer Ed Huey, who also served as Honorary festival chair, drummers Ganey “Pop” Hymes and Sammy Nix, and Cajun musician Steve Riley. NSU President Dr. Chris Maggio and Dr. Shane Rasmussen, director of the Louisiana Folklife Center, took part in the induction ceremony. Dignitaries also included Natchitoches City Council members Sylvia Morrow and Dale Nielsen, Kelvin Porter from the office of State Representative Kenny Cox, and Matt Howerton from the office of U.S. Representative Mike Johnson. Fifty-four craftspeople displayed their traditional work on Saturday. These craftspeople demonstrated and discussed their work with those attending the Festival. Craftspeople displayed accordion making, alligator and garfish jewelry, beadwork, baskets, bull whips, dolls, Creole furniture, Czech Pysanky eggs, filé making, flintknapping, folk art, knives, music instruments, quilling, quilting, pottery, saddle making, spinning & weaving, tatting, toys, walking sticks, whittling and needlework, wood carving, and more. Food vendors provided a cornucopia of traditional Louisiana foods to the Festival audience. Featured foods were alligator sausage, boiled peanuts, boudin link, fry bread and Indian tacos, chipped beef, cinnamon roasted pecans and almonds, fried cornbread, jambalaya, meat pies, turkey legs, hot wings, gumbo, red beans and sausage, barbecue chicken and ribs, mustard greens, crawfish pies, cracklins, hot tamales, peach cobbler, po-boys, and smoked sausage. Support for the Festival was provided by grants from the Cane River National Heritage Area, Inc., the Louisiana Division of the Arts Decentralized Arts Fund Program, the Lower Mississippi Delta Initiative of the National Park Service, the Natchitoches Historic District Development Commission, the National Endowment for the Arts, the New Orleans Jazz and Heritage Festival and Foundation, and the Shreveport Regional Arts Council. Much needed support also came from the City of Natchitoches and the Natchitoches Area Convention and Visitors Bureau. Support for the Festival was provided by generous sponsorships from many local and regional businesses, including Ackel Investments LLC, Acme Refrigeration of Baton Rouge, Bank of Montgomery, Brookshire’s #27, Brookshire’s #29, City Bank and Trust Company, Cleco, CP-Tel, Domino’s Pizza, Elite Broadcasting, El Nopal Mexican Grill, Family Medical Clinic, Georgia’s Gift Shop, Grayson’s Barbecue, the Harrington Law Firm, Jeanne’s Country Garden, Johnny’s Pizza, Little Caesar’s Pizza, Magee’s Patio Café, Morning Star Donuts, Patrick-Miller Tractor Co., Pioneer Pub, Pizza Hut, R.V. Byles Enterprises, Red River Midway Marina, Ronnie’s Auto Glass and Collision Center, Save-A-Lot, Sonny’s Doughnuts, Trail Boss, UniFirst, Walmart, Waste Connections, Weaver Brothers Land and Timber Company and Young Estate LLC. Numerous radio and TV stations sponsored the Festival by generously airing free promotional PSAs. Radio media groups include Baldridge Dumas Communications, Cenla Broadcasting, Delta Media Corporation, Elite Broadcasting, Red River Radio and TV stations KALB 5 Alexandria, KAQY 11 Monroe, KATC 3, KETK NBC EastTexasMatters.com, KNOE 8 Monroe, KSHV 45, KTAL NBC 6, KTBS 3 ABC, KTVE NBC 10, and WNTZ Fox 48. Print and online newspapers supporting the Festival included The Current Sauce, The Natchitoches Parish Journal, Shreveport-Bossier Fun Guide, and Shreveport Times. The success of the Festival was made possible due to the many volunteers from NSU’s faculty and staff, who gave generously of their time and talents. Thanks are due to Dr. Lisa Abney, Debbie Adair, David Antilley, Ashley Briggs, Dr. Patricia Brown, Kay Cavanaugh, Matt DeFord, Curtis Desselles, Mike Doty, Seth Douget, Heather Salter Dromm, Pam Dyes, Bruce Dyjack, Terry Fruge, Det. John Greely, Dr. Hiram “Pete” Gregory, Dr. Greg Handel, Det. Carey Hargrove, Hovey Harrell, Capt. Wesley Harrell, Blayne Henson, Kristie Hilton, Twana Hoover, Leah Jackson, Dr. J. Ereck Jarvis, Lt. Travis Johnston, Dr. Marcus Jones, Phyllis Lear, Lori LeBlanc, Charlene LeBrun, Dr. Chris Maggio, Coach Mike McConathy, Byron McKinney, Ashley Mitchell, Shadana Palmer, Erick Payton, Officer Terrance Petite, Bob Rachal, Charles Rachal, Kyle Rachal, Sheila Richmond, Leonard Sarpy, Christina Shields, Sgt. Bruce Speight, Stephanie Stanton, Officer Tim Swim, Charlotte Thomas, Emily Windham, Mary Linn Wernet, David West, Shirley Winslow, Dale Wohletz, Loletta Wynder, the Red River Sanitors, and Louisiana Folklife Center student worker Alexis Turner, and administrative coordinator Shelia Thompson. NSU students included Justin Burr, Brittny Jacob, Erica James, Katelyn Marchand, Ashley Ortego, Addison Pellegrino, Jasmine Poe, Steven Sheerin, Nicholas Small, Randi Sheppard and Gennadiy Vavrenyuk. NSU alumni included James Christopher Callahan, Angel Lewis, and Greg Lloid. Thanks also go out to Melanie Braquet, Sherry K. Byers, Don Choate, Jr., Helen Dalme, Dee Fowler, Ted Fowler, Lena Green, Diane Gunter, Dr. Don Hatley, Sue Hatley, Lani Hilton, Isabelle Jones, Peter Jones, Michael King, Henry V. and Nita Maggio and family, Charity McKinney, Jerry McWherter, Lana McWherter, Theresa Morgan, Sheila Ogle, Chris Presson, Jewel Presson, National Center for Preservation Technology and Training interns Richa Pandey and Alison Rohly, Audrey, Gidget, Susan, and Wyatt Rasmussen, Jeri Ray, Clettis Self, Dr. Susan Roach from Louisiana Tech University, Elvin and Betty Shields, Idell Snowden, Lorie T. Speer, Lori Tate, Leo “Buddy” Terzia, Floyd Turner, Mark Weinzettle, Krewe of Excellence member Ralph Wilson, and Angela Robinson with the LSMSA Foundation. Natchitoches Area Convention and Visitors Bureau staff members included Jean Carter, Arlene Gould, Anne Cummins, Katherine Johnson, Hammond Lake, and Madeline Matt. City Bank and Trust Company staff members included David Guillet, Emily Jordan, and Kenneth Thomas. Participants from Cane River National Historical Park included Dustin Fuqua and Rachel Thatcher. Participants from Fort St. Jean Baptiste State Historic Site included Tommy Adkins, Justin French, and Rhonda Gauthier. A special thanks goes to the Natchitoches Parish Detention Center trustees and Sgt. Fred Young for their help in setting up the Folk Festival.